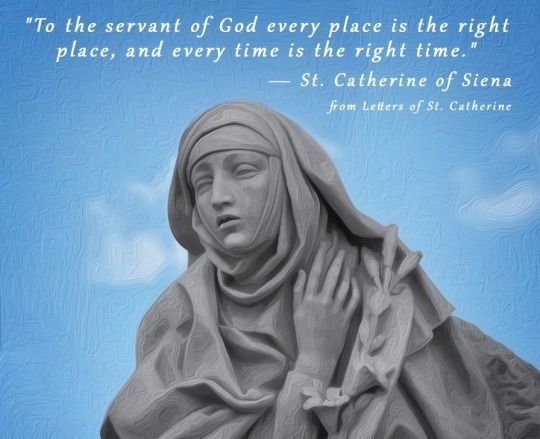 Blown away by St. Catherine of Siena! “Ungrateful people are not patient.” Letter T337. What makes people patient, so that they patiently bear hurt, reproach, slander, and abuse from others, and torments and assaults from the devil? Gratitude.“ Letter T336. "It is human to sin, but diabolic to persist in sin.” Letter T348. “Reflect that God requires nothing else of us except that we show our neighbors the love we have for God.” Letter T89. “And you may be certain of this–unless you really are more ignorant than anyon–that the arm of holy Church, though it may well be weak, is not broken. From its weakness this arm always emerges strengthened, as do those who stay close to it.” Letter T339. “We will be humble as we are obedient, and as obedient as we are humble.” Letter T84. “You must follow him along the way of the cross, choosing to be crucified in his way, not yours.” Letter T354. “Consider God’s charity. Where else have we ever seen someone who has been offended voluntarily paying out his life for those who have offended him?” Letter T345. “People have been set above all other created things, not created things above people, nor can people be satisfied or content except in what is greater than they. But there is nothing greater than they except I myself, God eternal, and therefore only I can satisfy them.” Dialogue 93. “Do not presume to choose your own way of serving instead of the one I have made for you.” Dialogue 100. “For you, high eternal Father, loved me without being loved by me.” Dialogue 108. “Make yourself a channel for all peoples, giving each of them what he needs, according to their disposition and what I, your Creator, give to you.” Dialogue 109. “A full belly does not make for a chaste spirit.” Dialogue, 125. “Now how can those who do not know their own sinfulness recognize and correct it in others? They are neither able nor willing to go against themselves.” Dialogue 129. “The will is the seat of all the pain people suffer, for if the will is fully in accord with my will there is no pain in suffering.” Dialogue 131. “You, God, made yourself lowly and small to make us great!” Dialogue 134. “The soul is as obedient as she is humble, and as humble as she is obedient.” Dialogue 154. “It is rare that a person who sins against the vow of obedience does not also sin against continence and true poverty.” Dialogue 158. “The obedient have no desire to obey in their own way, to choose the time and the place; they would rather follow the rule and their superiors.” Dialogue 159. “Obedience shows whether you are grateful.” Dialogue 163. “Obedience and her sister patience show whether the soul is in truth clothed in the wedding garment of charity.” Dialogue 163. “I acknowledge and do not deny that you love me before I existed, and that you love me unspeakably much, as one gone mad over your creature.” Dialogue 167. “For by the light of understanding within your light I have tasted and seen your depth, eternal Trinity, and the beauty of your creation.” Dialogue 167. “You, eternal Trinity, are the craftsman; and I your handiwork have come to know that you are in love with the beauty of what you have made, since you made of me a new creation in the blood of your Son.” Dialogue 167. “O abyss! O eternal Godhead! O deep sea! What more could you have given me than the gift of your very self?” Dialogue 167. “You are a fire always burning but never consuming; you are a fire consuming in your heat all the soul’s selfish love; you are a fire lifting all chill and giving light.” Dialogue 167. The majority of the above quotations are from The Letters of Catherine of Siena (4 vols), Arizona Institute of Medieval Studies, and Catherine of Siena: The Dialogue (Classics of Western Spirituality series), Paulist Press.